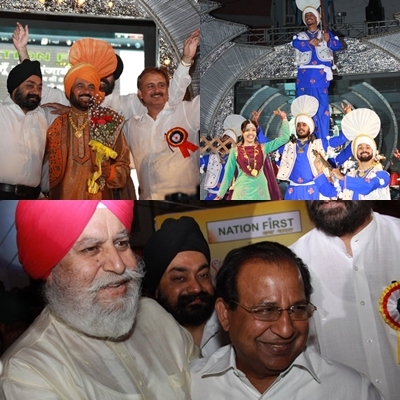 ‘Nation First’ celebrated Baisakhi with high spirit on Open Park, Jail Road, New Delhi.Sardar S. S. Ahluwalia, (MP) Deputy Leader, Rajya Sabha Sh. Shanta kumar (Former CM, Himachal Pradesh & Central Minister) and Prof. Jagdish Mukhi were the chief guests. On this occasion, Punjabi Singers Pammi Bai, Dilbagh singh and Punjabi Dance troop BMP Fire performed live. The performers entertained the large number of music lovers gathered at the venue for the celebration of Baisakhi. The perfomers rocked the stage with traditional Punjabi songs. The main aim of the NGO ‘Nation First’ is to promote young talents, encouraging Sports activities and supporting public opinion forum. We celebrate all festivals of different communities, said Suresh Kumar from Nation First.